Flavoured gin reviews, information, tasting notes, botanicals, and garnish and serving suggestions - for gin lovers and the trade. Find out more about your favourite flavoured, infused and fruit-led gins and discover new gins with the 'You Might Also Like...' recommendations. Follow our tasting notes and serving suggestions to help you enjoy them even more, or find out where to buy each gin, make a trade enquiry or book a distillery visit. Manchester Gin Wild Spirit - New Review! All gins listed have been tasted independently by The Gin Guide, offering our opinions and tasting notes alongside information and key facts about each gin. 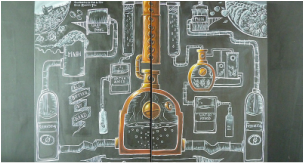 The Gin Guide tours distilleries, gin bars and gin events to discover and taste gins ranging from old favourites to the latest gins to market, and from distilleries across the UK, Europe and the rest of the world. Flavoured Gin or Gin Liqueur? Flavoured gins and fruit gins are hugely popular, for lovers of traditional gins who enjoy a bit of a twist, and for those who enjoy a fruitier spirit with their mixer than a classic gin. 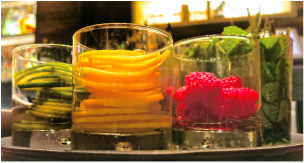 A common question we get asked is the difference between gin, flavoured gin and gin liqueurs. Ultimately it comes down to the alcohol percentage (ABV) and the flavour profile. Below we explain the impact of each and offer The Gin Guide Awards' definitions of each variety of spirit. For a spirit to be classed as a gin in the UK it must be bottled at 37.5% ABV (alcohol by volume) or above. Anything lower and it would be a gin liqueur or gin-based liqueur. By definition, the prominent flavour of a spirit must be juniper for it to be called a gin. However, it's a grey area and major debate in the gin industry as it is a subjective rule. Gin is a spirit bottled at over 37.5% ABV and, crucially, with the predominent flavour of juniper berries. Flavoured gin is a spirit bottled at over 37.5%, with juniper featuring alongside one or more other prominent flavours. Gin liqueurs are spirits bottled at below 37.5% ABV (often 20%) and featuring gin as a base, and typically sweetened.